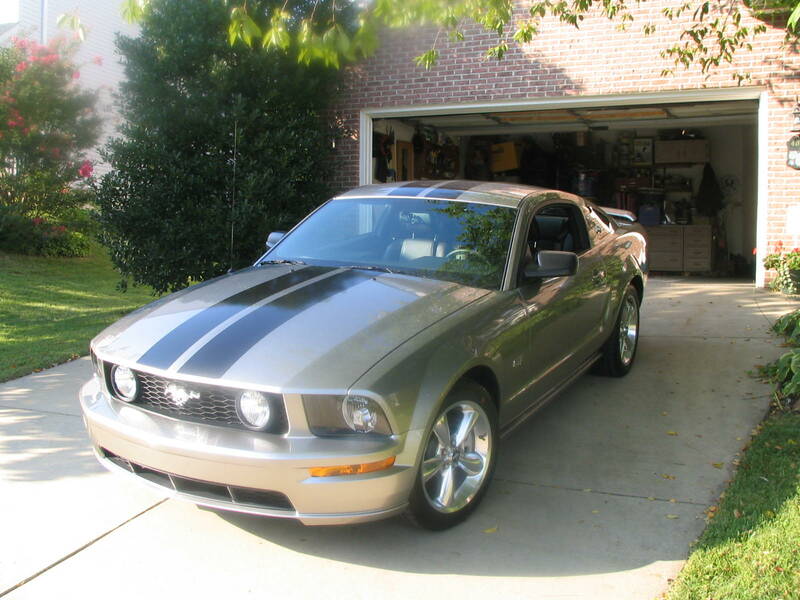 Hey guys (and girls) I am thinking about putting some stripes on my Mustang. 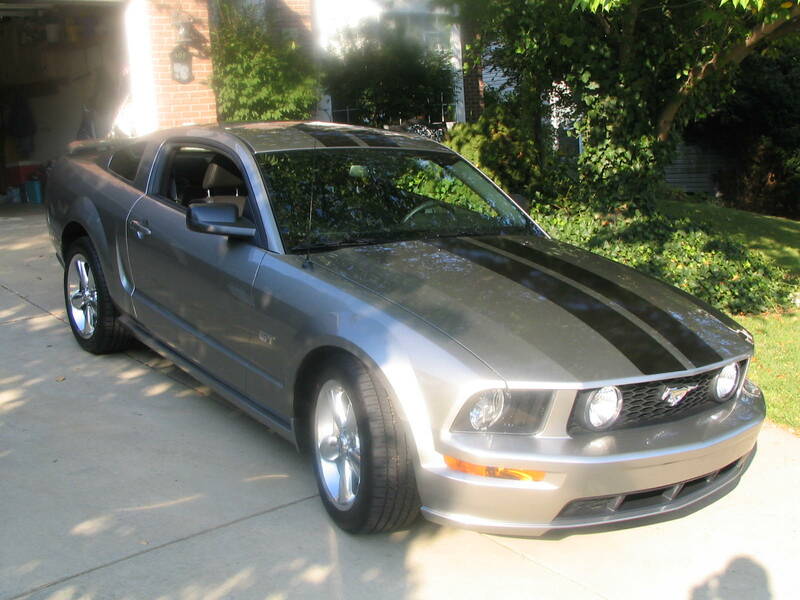 It is Vapor Silver and I like the 10 or 12 inch regular racing stripes, but can't make up my mind on the color. -or I even saw a silver stang with white, that looked OK, but not sure about it. I've never been fond of the silver and black combo. I plan to get stripes of the white persuasion to go on my satin silver. The light silver with vapor might look really good, kind of a ghost effect. I know there is a stripes thread somewhere on here, check it out and see if you like anything. 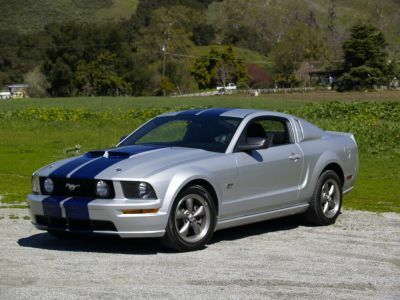 Anyways, originally I wanted the light silver, then the GT 500 KR came out with the blue stripes and looks awesome. 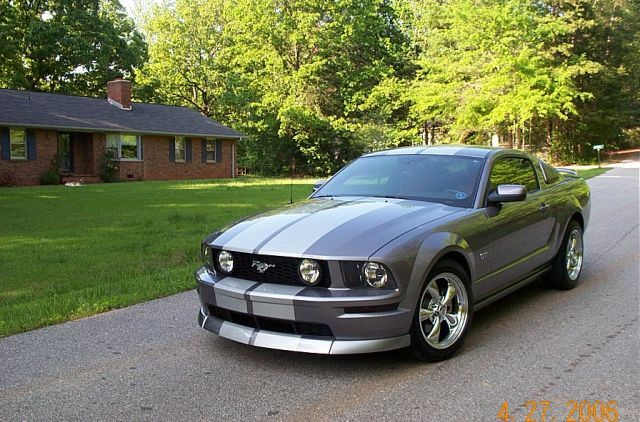 After looking at the pics of other peoples Mustangs with the blue stripes... it just doesn't do it for me. 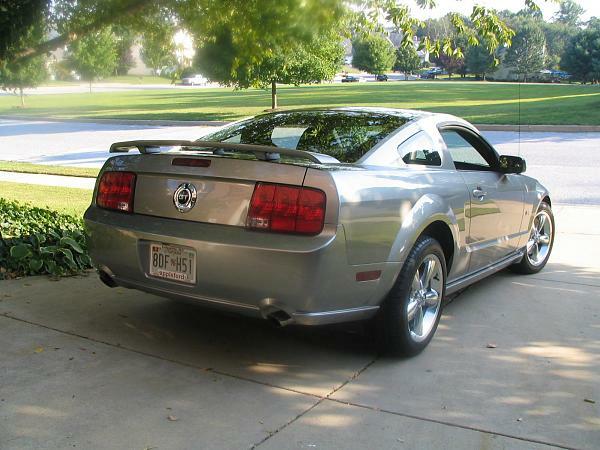 I think I might listen to Von Bek and do the light silver (with the CDC Classic CHin Spoiler) Like the one pictured. I Put one of the blue ones I found on there too. IMO the blue is too dark. My eye is drawn to the stripes, not the car. The blue in that photo is not the same blue as used on the KR. The KR is closer to Ford blue. It depends on if you're looking for subtle, or bold. For subtle, I like the silver. It's classy. For bold, go check out the KR again and use that shade of blue. I think it's killer. And go with the 12 inch stripes. I had 12 inchers on my '05 and had lots of compliments. I'd say skip the stripes altogether. If you are going to do stripes, do the GT500KR blue that the GT500KR show car has on it! Great idea. 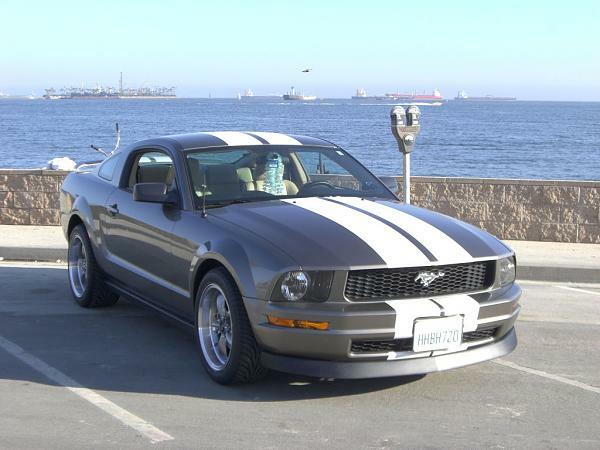 I was also fond of the light silver stripes that was on one of the pre production coupe show cars that toured the autoshow circuit in 2004/2005. 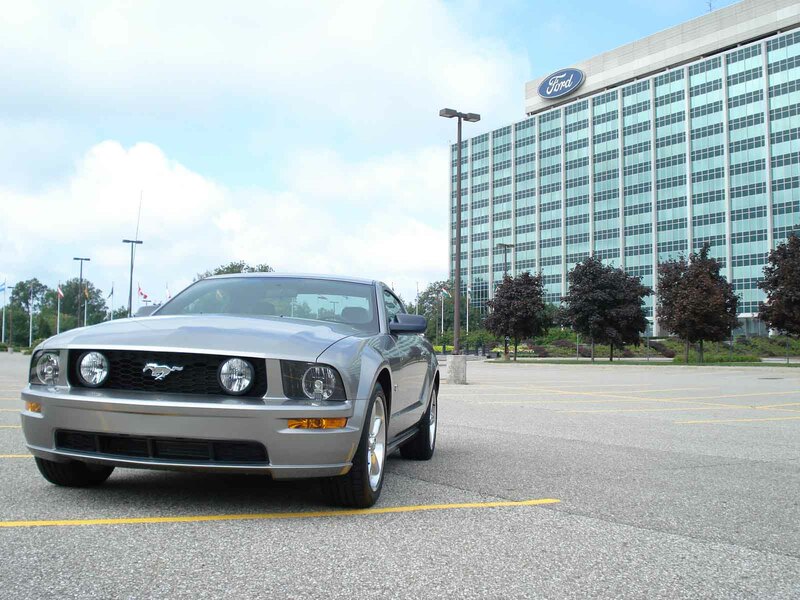 The original 2005 Mustang Show Car from Detroit (2004 show) had some sort of Pearl White stripes. I remember this car because the 18" fan blades were on the car, but not offered on the original production run. I LOVED this color combo. 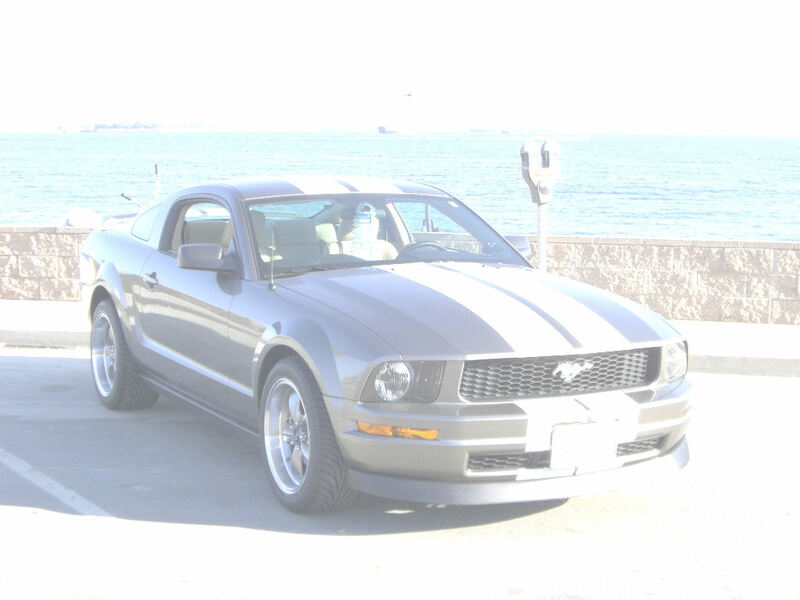 I think this is Donna's car and if so it is Tungsen, not Vapor. Wow, lots of responses. You guys all had great comments (even tried to photoshop your own car) I know the pictures I posted above are not Vapor or the blue is not even close to the KR, but really I saw within this site. Thanks for that auto show picture too, that looks sweet! Only thing I am wondering about the blue KR stripes is if it looks as good on a regular GT? It seems like I could put the blue on and love it or hate it. I allready know the light silver works. White does look great too, but prefer silver.. Black, I think is too bold for me. The black looks cool on you car.. Have you ever thought about continuing the stripes down the front and back? I think it would look pretty sweet, although it looks nice now. Superstripe would look cool too, especially with the shaker. BSM is sending me a sample of the gloss silver stripe so I can kinda get an idea of what it will look like on the vapor. If it looks good, I think I am gona go for it. Oh yea, Lets start an official Vapor thread.... We need it! Got white on my silver satin. Visit Eduardo de Sousa's homepage!